Listen, we all know a guy who's maybe not the smartest or most evolved of humans. Perhaps he never learned to read good, or maybe he relies solely on poorly constructed and illogical memes to drop the mic on all Facebook arguments and debates. We can’t all share the same gifts! Sure…the world would probably be a better place if all of us were intelligent, and most likely the health and longevity of our planet relies on it, but it hasn’t happened yet, and so we must embrace the positive aspects of each person and learn to appreciate them for what they are. For instance, when it came to the original squad of dinosaurs, T-Rex here was probably not the smartest, kindest, or most chill person to invite over to your dinner party. He was loud, crude, and clumsy, and if you were a meat product of any kind, he would definitely try to eat you. He didn’t have the brain for stimulating conversation, but you gotta think that, what the dude lacked in manners, he must have made up in personality, right? Maybe he was really good at jokes, or used his muscles to turn out a few cool party tricks, or maybe he was one of those guys who was really good at making fun of himself so as to put everyone around him at ease! Because hello…you don’t become the king of the Cetaceious period unless you know how to work with what you got, right? That's why this Adult Plus Size T-Rex Dinosaur Costume is so great...made out of sculpted velour reptile-print fabric, it shows a softer side of the T-Rex. The soft green bodysuit has attached lizard-like feet and hand covers, and a big plush tail to wave around during your festivities (because what else disables fear of a ferocious meat eater better than a few choice dance move, yeah?). 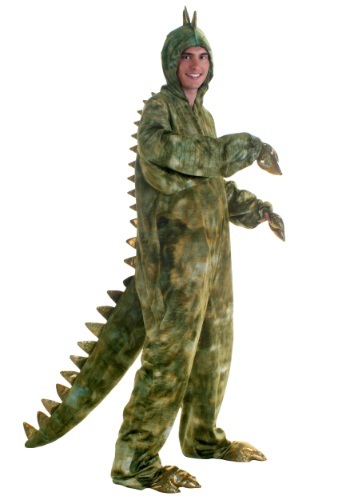 So go ahead...slip on this T-Rex costume and show everyone that there's more to being your favorite dinosaur than having the logic reasoning and future planning skills that would have likely saved them from total extinction!